The high speed sticker labeling machine is regarded as the most modern equipment for labeling vials. It includes the state-of-the art label dispensing system which is controlled by a micro processor. Moreover this versatile vial labelling machine is easy to use. It is simple and sophisticated; and also integrates a sensing system for labels as well as products. In fact, it is the most appropriate equipment for labeling vials that are round in shape, and bottles that are small in size; and many other similar objects which are produced using different types of materials such as HDPE, PET, PP, glass, plastic, etc. 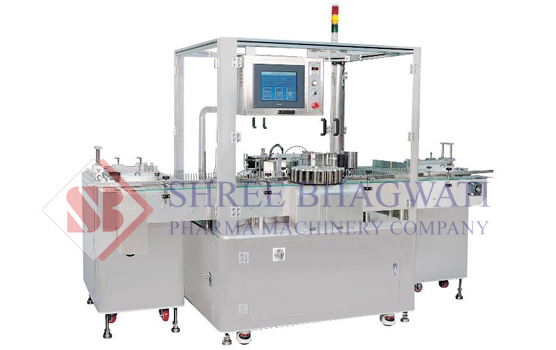 Further this relatively faster model of vial labeling machine has the capacity to label 300 units in just one minute; as per the diameter of the product and size of the label. Another exceptional feature of the high speed sticker labeling machine is the unique roller spacing device and the special no parts change system. As a result the users no longer require the feed worm or star wheel in order to equally separate the products. Besides this strong and long lasting machine also possess a highly synchronized, single point speed control system. Another striking element of this vial labelling equipment is the inherent and computerized label length detection system. This helps you to discontinue the system of manually feeding and storing the label length details into the memory of the machine; and later on retrieving the same information whenever you need to change the label size and restart the equipment. As a result this advanced system saves your time, avoids machine downtime, and ultimately leads to a higher rate of production. Moreover it is also available with an optional safety cabinet which is built using highly durable glass or acrylic material. This sticker labeling machine actually incorporates all the primary requirements of the current market.